The wonderful common name for this large (~75 mm) rotund frog is derived from its resonant call: a loud ‘bonk … bonk … bonk’, usually made following rain from October to May while concealed by water in dams or ditches, or from holes in a bank. It is also known as the Northern Banjo Frog or Northern Popplebonk. The Popplebonk is generally grey-brown above with irregular yellowish or red markings on its side and a distinctive scarlet groin (usually hidden by the legs). A thick yellowish gland runs from below the eye to the shoulder. The toes are almost unwebbed. The upper surface may be slightly granular, but the underside is smooth and pale. Popplebonks can be found in river flats and near water in forest and woodland habitats throughout the region. In dry times they burrow into the ground to keep themselves moist (Indigenous people used to use them as an emergency water source), so gardeners may occasionally dig them up. 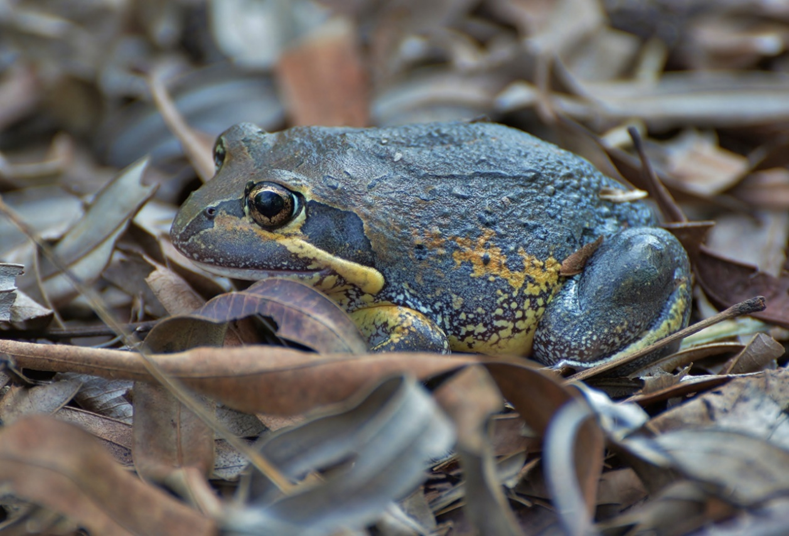 Out in the open (emerging after rain), the frog has an upright stance and may be accidentally mistaken for a Cane Toad, so please be careful if you take part in a toad cull. The eggs are laid in a foamy mass on the surface of dams and the tadpoles are large, with uniformly dark brown bodies and mottled tails.